Anyway, getting back into shape can mean very different things to different people. For me, it means I want to build muscle, lose fat, get rid of the deflated balloon that has taken over my midsection, and fit into my old clothes (and finally buy some new ones). Getting back into shape is not me having a fight with the scale or starving myself or trying crazy diets. When I’m hungry, I eat, even if it’s at 9 PM. If I’m thirsty, I drink water. I don’t skip meals or food groups, but over the course of the last few years I have definitely changed my eating habits by eating less packaged and processed food by making most things at home and eating more vegetables. Still, I love butter and sugar, and turning them into cakes and cookies, just not all the time. I’m not trying to get a thigh gap. Frankly, I think I would feel really weird if my thighs didn’t touch, my body wasn’t built that way and I’m glad. Getting back into shape means that I go to the gym most days, and when I can’t go I work out at home and do my best to spend a good portion of the day on my feet and moving around. For me, this is about being healthy. It’s not about hating my body and beating it into submission, which I think is how a lot of women feel when they think about weight loss. Oh but wait, I haven’t said anything about weight loss, I’ve said I want to build muscle and lose fat, and that I think is key. I am not concerned with the number on the scale as much as I am with the number on the tape measure when I put it around my waist every couple weeks. In this game of numbers, the scale is usually your worst enemy. In fact, in the 5 or 6 weeks that I’ve been exercising regularly, I’ve only lost a few pounds, but I’ve taken two inches off my waist, which is significant and far more motivating than saying I lost ten pounds, but still being super jiggly. 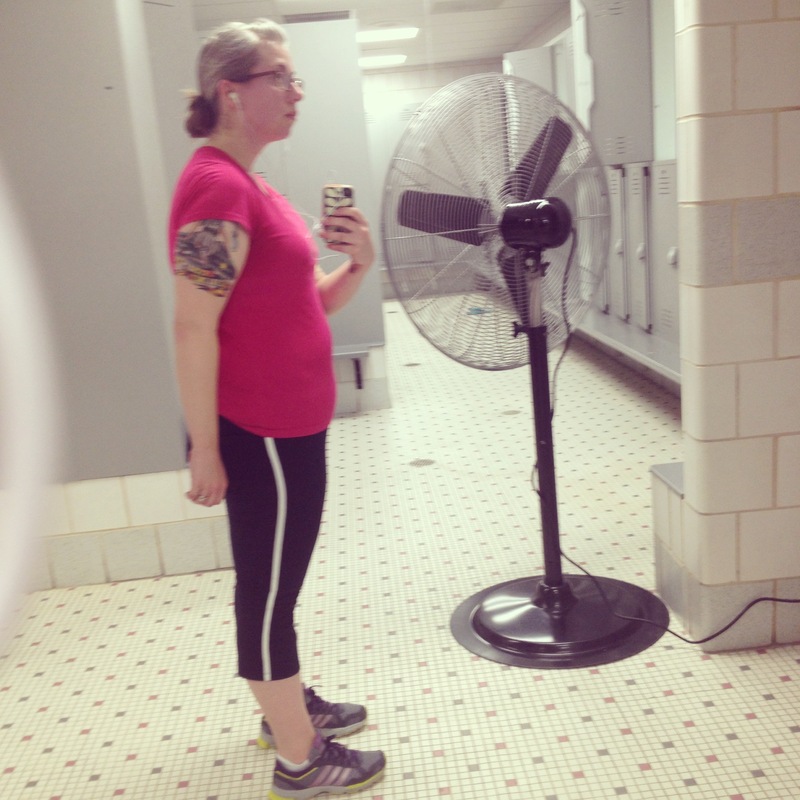 If you look at the photos you can see that my midsection has come in and will continue to come in not because I’m running a marathon every day, but because I am approaching the deflated balloon with a two pronged attack: 1) carving out the muscles underneath while 2) whittling off the layers of fat on top. Pilates. Again, I like pilates because I can do them at home and they help me pull in my middle and stand up a little taller. Cutting back on sugar. Between the end of my pregnancy and the holidays I acquired a big sugar addiction. This isn’t to say I was sitting around eating 5 or 6 cookies a day, but I definitely was helping myself to a little something sweet after lunch AND dinner. I decided for Lent I would give up dessert, and the first few days have been tough. I definitely feel that I need something sweet after meals, even though I totally don’t. 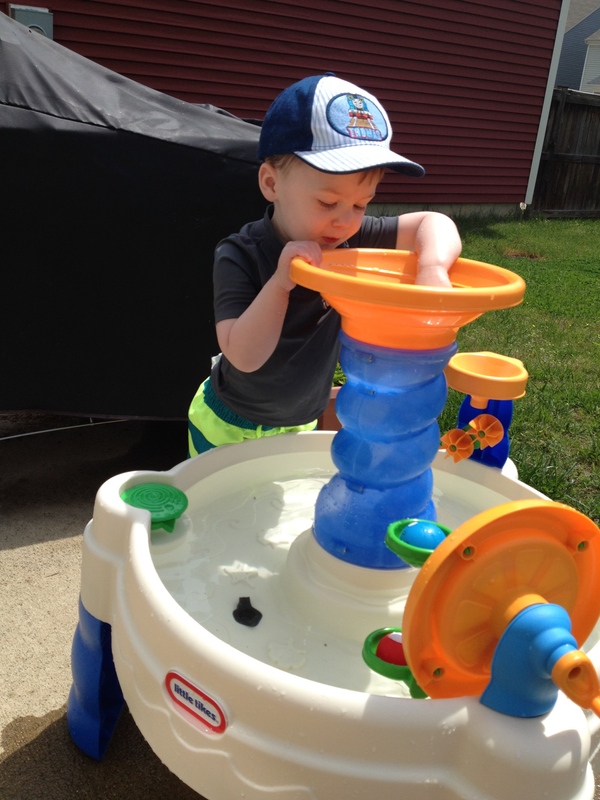 Paying attention to inches and not pounds or even calories. Like I said above, getting into shape is a total numbers game, so it’s important to focus on the right ones. I do weigh myself regularly, but it’s only part of the equation. Since muscle is more dense than fat, as I have built back muscle while losing fat the scale numbers haven’t budged much but the tape measure has. Also, as long as I’m making sure to eat well, I’m not sitting around calculating my day around every last calorie. This blog post does a great job of explaining how women have become calorie obsessed and why we really shouldn’t be. Running: I enjoy running, but I need to get a bit smaller before I can start back at it so as not to add undue stress to my knees. The rowing machine: These are great for working the whole body, I just need to start making time for it when I go to the gym. More strength training: Now that I feel myself getting stronger, the weight section of the gym is a lot less intimidating. I know that this is a process, and it will take time. I know that there will be plateaus, and frustration, and times when I just can’t put in as much effort as I want to. But sharing my story here has been a big help. I can’t wait to share more of this journey with you. 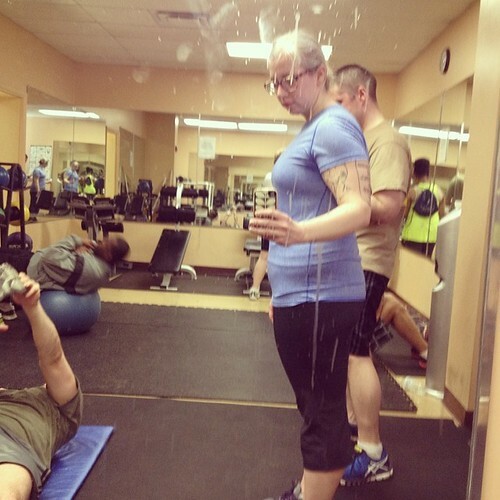 I’d also love to hear about your own fitness stories and what’s been working for you. 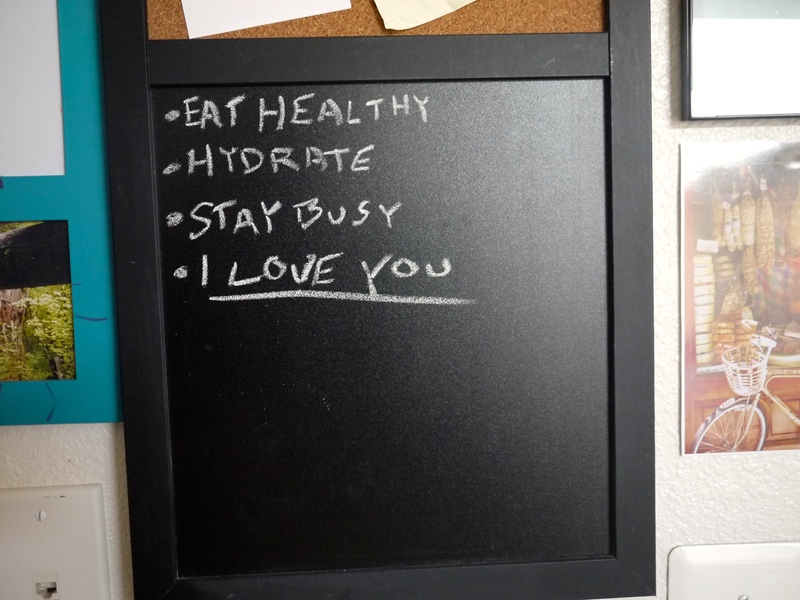 Shortly after I came home from the hospital with our newest Cub, DB wrote this on the chalkboard in our kitchen. I guess in a way these four little things are like our new year’s resolutions, but I think they reach beyond that and help us to stay on track as we adjust to being parents of two and get ourselves back in shape after a long, hectic, and stressful holiday season. I always find that the cold of the winter can really knock me off track when it comes to things like eating healthy and staying busy. The allure of a warm electric blanket and a snuggly new baby can make it hard for me to want to go to the gym, or study for tests, or put laundry away. But all those things need to get done, and when they don’t I really can’t blame the blanket. The frigid temperatures we’ve had around here lately have made things even more difficult, since it always seems more appropriate to eat comfort foods drowned in cheese than it does to eat a light soup or a salad. Still I find that having things written down in plain sight has been really helpful. It’s driven me towards the bowl of oranges instead of the stash of chocolate in the freezer as well as out the door and to the gym for about an hour a day these last two weeks. It also helps us to keep each other accountable, for the first time in our marriage DB and I are carving out time to work out together, which has been surprisingly enjoyable. I’m also branching out more in the kitchen, trying new recipes that are comforting without weighing us down (literally and figuratively). 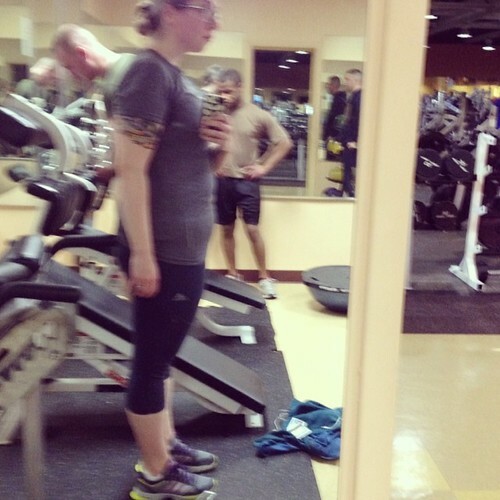 Every Monday I’ve decided to take a progress shot of myself at the gym. 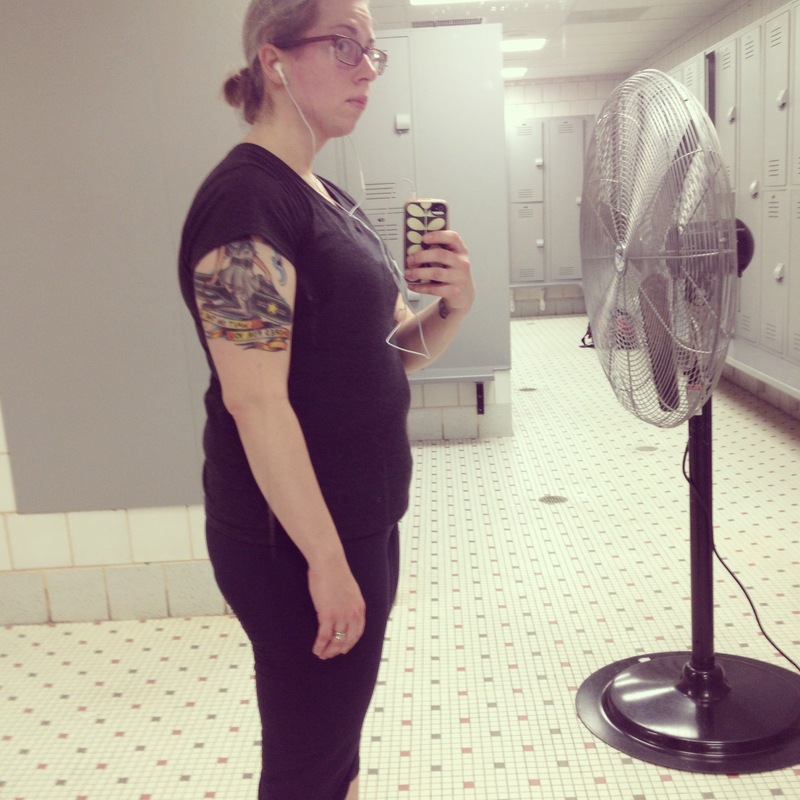 I’ve been posting them up on Instagram but I’ll also be sharing them here so that I can have even more accountability partners, but also that I have a frame of reference to see where I was when I get to where I want to be. Health and fitness can be a long and frustrating road, but I need to remember to take baby steps, stick to the simple things, and keep pushing through till I make.